Operator of ADD Crusher, an online instructional video program focused on helping those with ADHD learn various management strategies and “brain hacks,” Alan Brown discusses on the show his path from drug addict to successful entrepreneur, and how the fear of failure can be both a hindrance and a motivator. Covering a number of productivity ideas and strategies, Alan addresses the role good habit-building and self-worth play in working toward one’s goals. 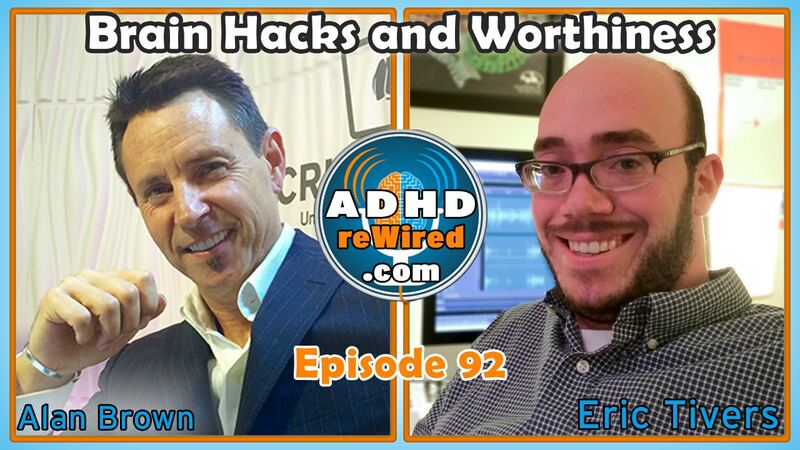 Alan Brown was previously a guest on ADHD reWired episode 25. Diagnosed later in life and following years of drug addiction and poor school performance, Alan dove into books on the subject of adults with ADHD. However, realizing his lack of reading skills, and acknowledging that many others with ADHD had similar issues, Alan wondered why there were no multimedia-based instructional programs to help those with ADHD. Years later, Alan created ADHD Crusher, a video-, audio-, and graphics-based instructional program based on brain hacks and productivity tips to help those with ADHD. This year, Alan launched Crusher TV, an online video program for a broader productivity minded audience. Alan tries to keep the content lighthearted: he says about 85% of it consists of evidence-based brain hacks, while the remaining 15% is humor. Eric: Sometimes, especially amongst those in the ADHD community, when people see content that’s extremely well-produced, they become skeptical of it. Those with experience in the TV production world or, like Alan, the advertising world, will tend to have a better handle on what constitutes a high-quality production. Eric reiterates the importance of stories and storytelling: they help keep entertaining and relatable the scientific research and strategy information on the show. People are looking for real solutions and to have those solutions be presented in an easily digestible way. Previously, Alan told Eric about Brendan Burchard’s one-page productivity sheet, which Eric has now adapted into a “super-flex” productivity notebook with a weekly scope, as opposed to a daily one. When Alan needs to manage three separate components at the same time and is having trouble compartmentalizing and prioritize them, he will turn to the one-page productivity planner. “Clumping” involves identifying a group of related tasks, binding them together, and then scheduling a time to work only on that group. Using this strategy even a few times per week can be great for productivity and is what Alan uses to manage his workload. Eric: Productivity hacks for ADHD also apply exceptionally well to those without ADHD. Alan mentions how Edward Hallowell once said that roughly half the people seeking him out for help turn out to not have ADHD – they just display certain traits similar to those in ADHD. After reading much of the work of Brené Brown this past year, Eric added the factor of shame to his productivity presentation at the 2015 CHADD conference. Calling it “the elephant in the room,” Eric emphasized the connection between productivity and feelings of shame, vulnerability, failure, and fear. Following recovery from a decade of drug and alcohol addiction, Alan personally has dealt with substantial shame and fear as potential barriers to his productivity. Every single day, as Alan checks through his to-do lists and schedule, he is reminded of the fear of failure and the shame of his past actions. Following his ADHD diagnosis, Alan’s career, which he began pursuing at age 29, progressed upward dramatically. In the space of two years, he went from an average job to a VP management director role and earned employee of the year – while co-founding a successful startup company. However, with reaching each higher rung on the ladder of his career came a greater fear of failure. Especially when investing time and money into a whole new idea, it can become scary. Alan uses the fear to fuel him, calling it a “nagging desire”. Citing Russell Barkley, Alan mentions how using one’s emotion can help fuel our “rocket fuel” to keep us going. The emotion Alan uses is desire. He maintains a constant memory of where he used to be with his drug addiction, slow schooling, and financial problems and uses it to keep the “fire of desire” burning. During the conclusion of a recent ADHD reWired Coaching and Accountability Group, one participant told Eric they now felt so much more comfortable in their own skin – a comment that drives Eric and motivates him going forward. In one ADD Crusher workshop Alan conducted last year, he remembers having some younger pre-teen attendees brought by their parents. One told Alan, after the workshop concluded, that after seeing him talk and seeing all the others in attendance, he realized he was no longer alone and that he was a part of a family. When you take on a task so substantial or involved that you can’t reasonably walk away from it – like a podcast or a startup business – the heavy obligation to others and yourself will tend to keep you working and moving forward. Alan talked recently with an attorney, Rob Tudisco, who has ADHD and is also a runner. Rob talked about breaking through mental barriers and used the nine marathons he’s run as an example. Many of those with ADHD feel they’ve “faked” their way through many obstacles in their lives, such as school, relationships, family, etc. Rob said: One of the reasons I run marathons is that I can’t fake it. You can’t fake a marathon. When you sign up for a large task that challenges you and your executive functions, motivations, and abilities in order to maintain it, that’s where people will begin to tell themselves that they can no longer fake it. Also, introducing more procedures and processes for efficiency and management becomes a necessity for completing these more substantial tasks. Give yourself a negative nag: remember what really annoyed you about your ADHD in the past. Give yourself a positive nag: think about what you really want to achieve, then write it down so that every morning you can look at it and every night you see it before sleeping – maybe use it as a bookmark alongside your nightly reading. When you feel mentally fatigued: sit down, place your hands together and your feet on the ground, close your eyes, and for twenty seconds be completely quiet. Eat walnuts and dried apricots: they have protein and fiber-rich glucose.